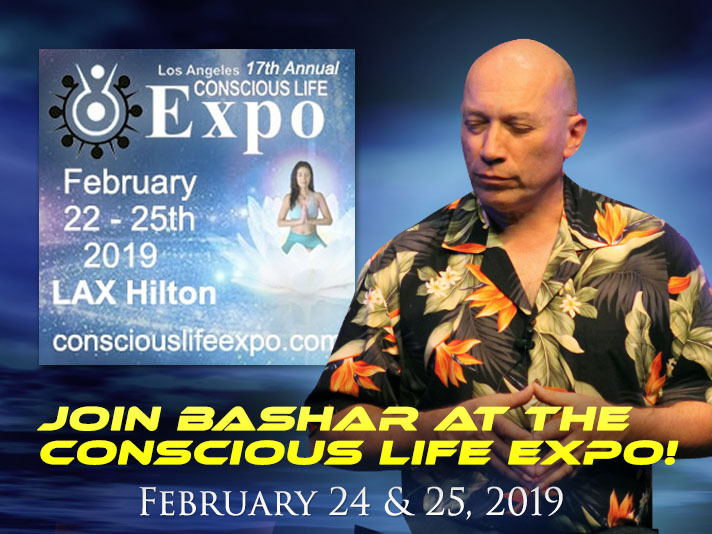 Join us at the Conscious Life Expo in Los Angeles, California! Join us for a 4 day dynamic experience to explore evolutionary transformations and new paradigms in spirituality, science, the cosmos, longevity, relationship, healing and well-being. Register today and participate in the conscious co-creation of our future! February 22nd – 25th 2019 at The Hilton Los Angeles Airport Hotel featuring Workshop Presentations with notable luminaries and best selling authors, 10 Inspirational Panel Discussions , 115 Free Lectures, 5 Exhibit Halls, Post Conference Intensives, Special Events, Speaker Reception, Free Opening Keynote Marianne Williamson, and a Gourmet Organic Food Court. Plus Programa Hispano! In this workshop, Bashar will explain how we use the illusion of time to creatively navigate our path in life. The Bashar transmissions are designed specifically for your mind and your imagination to be fully activated, inspired and to accelerate your personal journey of transformation! For 34 years, Darryl Anka has channeled the remarkable multidimensional being known as Bashar. Bashar describes himself as an extraterrestrial being from the future; a “contact specialist” who is specifically involved in preparing Earth for extraterrestrial contact. He explores a wide-range of subjects from a unique perspective of knowledge, with great insight, humor and a profound understanding of how we manifest our experience! Identify your life’s purpose and the unique, personal map within you for expressing your full creative potential. Experience another level of yourself. Your “Higher Consciousness” understands the Laws of the Universe and is able to guide you in applying this knowledge in even the most challenging situations. Transform negative beliefs, such as self-doubt, low self-esteem, lack of motivation, and deep hidden fears into positive energy that you can use to amplify your abilities. Your most exciting dreams can support you! Uncover unconscious beliefs that can sabotage your ability to be fully supported by your passion and live the life you have always dreamed of!